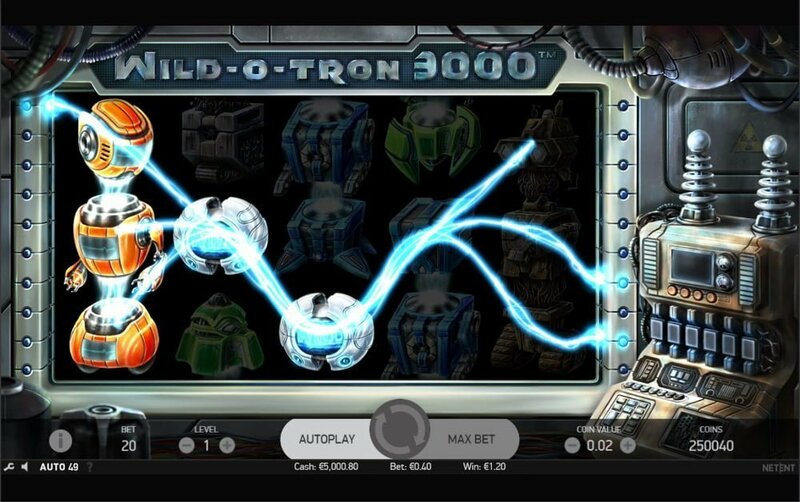 Wild-O-Tron 3000 is a low variance video slot machine from Net Entertainment that pays a jackpot (non-progressive) of 500x your stake on a single spin. Pertaining to its in-play bonus rounds it has a Wild-O-Tron feature (electromagnetic machine goes into a hyperactive state) and wild substitutions. 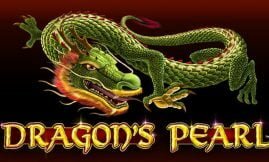 Bets are made from £0.20 up to £200 per spin. If we take into account the max bet per spin we find it rather ludicrous because the biggest win of 500x per stake really doesn’t justify it, but hey that’s us. 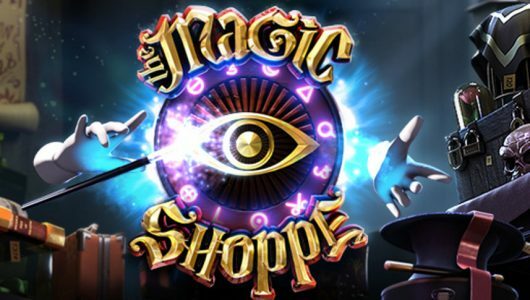 The game’s visuals are rustic while the payouts are surprisingly low. Furthermore, it has a 1980s sci-fi robot theme with 20 paylines (fixed), 5 reels and 3 rows. The RTP (average return to player percentage) is 96.01%, to say the least we’ve seen higher variance slots with a better RTP. Question is has NetEnt gone full-tilt with this release? Let’s find out. When we glanced at the Paytable we saw that it showcases 7 different types of robots each with its own cash prize. 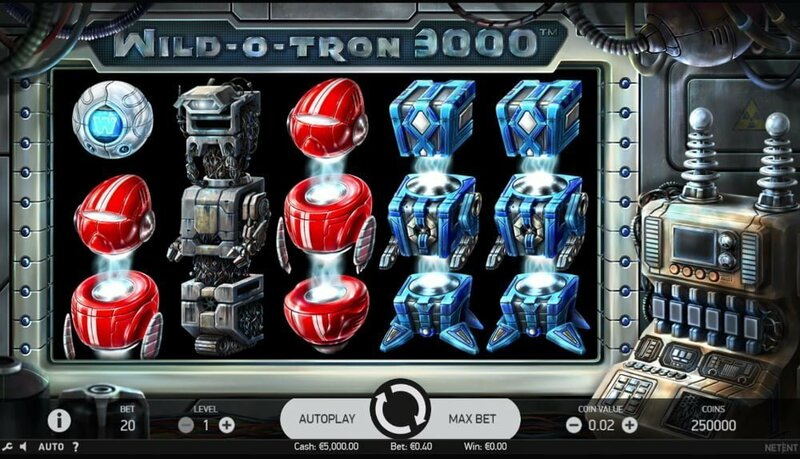 The symbol that pays the most is the red robot, hit 5 of them on an active payline at the maximum wager you’ll win 300 coins. The robot symbols appear stacked therefore it is possible to score a full screen of them on each spin. The wild is the symbol with the ‘W’, winning combinations are completed by it when it substitutes symbols adjacent to it. Payouts during the main game could have been better this is why it’s important to trigger the bonus round (Wild-O-Tron 3000 feature). Before we dive into the bonus round there is no free spins feature, it only has the Wild-O-Tron 3000 that’s triggered randomly on each spin. 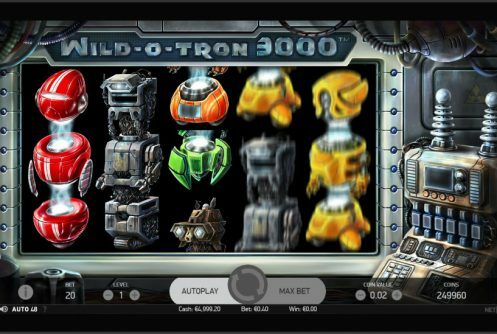 Luckily it’s triggered often, basically 1 to 6 robot symbols are transformed into wilds – a full screen of wilds is possible offering a payout of 500x your stake. This about sums up this low variance slots and what you can expect from it, it’s not the most innovative feature by a long shot. Surely NetEnt could have done better with Wild-O-Tron 3000. Here’s why. It lacks decent wins, it’s low variance not to mention the paltry payouts. Wins can be decent though but don’t bank on it. 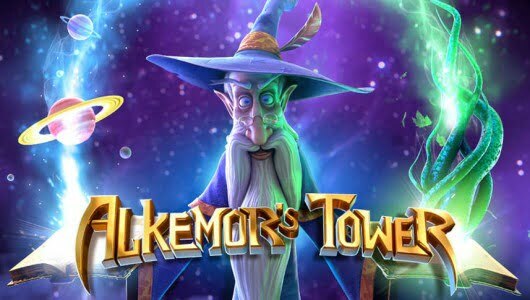 If you enjoyed the slots try out Alien Robots from the same developer; the volatility is higher, it comes with a free spins feature that awards a cool 50 free spins, the jackpot is 50,000 coins and sticky wilds spices up play during the main game and free spins (https://casinowhizz.com/slots/alien-robots-slot-review-bonus/). It only has one bonus game known as the Wild-O-Tron 3000. With that being said it’s relatively easy to trigger and you can score a decent win. 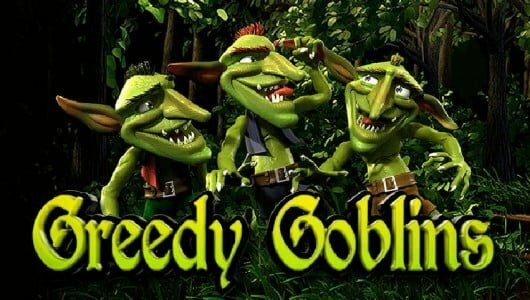 What’s the theme of the game all about? It is about the rebellion of robots in a lab they decided they will no longer serve humans. Which robot has the highest value? The red robot pays the top win, 5 of them pays a decent sum at the maximum bet.